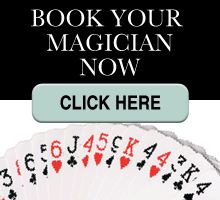 Professional Magicians has helped hundreds of leading companies to entertain their guests at promotional events, conferences, sales meetings, field marketing and award ceremonies. By performing walk around magic as your guests arrive at the venue, our magicians really help everything run smoothly and your guests have a magical experience which they will remember and will talk about long after the event. During a dinner or award ceremony, our magicians can move from table to table entertaining between courses. 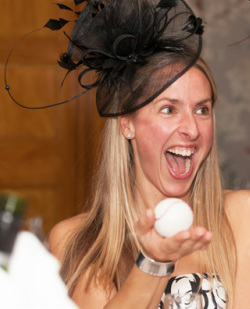 For less formal events, using a magician to 'mix and mingle' with your guests, performing close-up illusions, often in your guests own hands, is a great way to 'break the ice' and make the event even more memorable. Many of the magic effects they perform can be tailored to include the theme of the event or build in an aspect of the key message you may want to communicate. "I have seen magicians on TV and although it is amusing, I was never really impressed with magic boxes and floating assistants etc. This is something else completely! I only had three coins in my fist, and then the magician just looked into my eyes and asked if I could feel anything happen in my fist. In that instant, I felt like a ten year old boy again - full of wonder at the magic of it all, as I felt an extra coin arrive in my fist! He was standing three feet away from me at the time!" - Simon Harris. Copyright Professional Magicians 1999 - 2016. All rights reserved.